I have sadly lit the Mesowarrior candles twice in one day. I had a message last night for Cat who has been talking with me for a long time as we work out getting Keytruda private for her Gran. She is a very caring Grand Daughter and we had made arrangement’s to meet at the TUC Mesothelioma Action Day on July 1st but it was not meant to be. Cat Gran was being made comfortable and yet bless her she was thinking of me and telling me to carry on with my fight Cat sad — Nan is leaving us now. Her choice. She was looking forward to meeting you and said she hopes you continue your good work for a long time. That really got to me and we carried on talking until we went to bed . Then this morning Cat gave me the sad news her Gran had gone. Just doesn’t seem like enough. How this time must be so rough. and you’ll eventually feel much better. Will focus on the good, not the bad. I share these with you as you can see we have so much fighting to do to get Research coming through and to fight this disease. so My speech will be about Research and how we need funding. I have the speech already and I’m very proud of it one of my best ones I believe. Anyway life goes on for us and we have had lovely sunny weather in between the very heavy showers. Gardening has been underway and we have pottered around and feel straight again although the plants have grown so big with all this free watering. I don’t like the telly at the moment– Oh dear to live in the UK now we are scared to utter one word about anything political as you get jumped on. I think its very sad and I hope they get with forming governments and showing they are in charge as I dread to think how it will go. People fighting in the streets and on Face Book is very sad. Very flat and it lots of hardstanding which we were so pleased when a huge storm came over. Where the toilet block is Ray found it was under water. I had wondered as I saw a trailer tenet travelling- as I thought -on its own but could then see a small tractor pulling it. Everyone came over to our side where we were OK. It was a great night sleep and then we woke up early to go back a juction of the M11 to Duxfiord. What a great way to go to a meeting. A really lovely Conference Centre within the Duxford Museum. ray was able to wander around freely to look at the planes. We all sat down in a room and the Mesothelioma UK meeting -Are we making Progress started. Dr Robert Buttery from Papworth headed the meeting. We had already met at iMIG but then I had met half the room there so it was so friendly. Dr Najib Rahman from Oxford Respiratory Trials Unit,talked about Diagnostics and Bio markers . Seems to me we just cant beat the pleurodesis talc op. Why some Ops dont work is because the lung is trapped and doesn’t inflate fully so it doesn’t stick to the chest wall. and so a chest drain is needed permanently. Dr Doris Rassi gave a talk on Progress in Pathology and we are a long way fro being able to have an early warning system of Mesothelioma through blood tests. He spoke about all the trials he is working on and making progress. and DR Robert Rintout also did a trials update. We are moving into an exciting time and so much is being done to fined the answers. She talked about End of life care. Then we had a Coroner David Heming and I was dreading listening to him. BUT he was brilliant. He read a write up from a carer and what she had gone through then the feeling of alone as she travelled with out her loved one by her side. I was later at question time to be able to ask him about making sure they always put mesothelioma as the cause of death. bi-ops and said it is rare for the need of a PM. That going to court is made as pleasant as they can in the circumcises which is something all carers dread. Also a very interesting point is something I had been thinking about and that is I needn’t leave my whole body to science just my left lung. I have given it a lot of thought and think it would be Ok to have that go I have mentioned it to Ray but he doesn’t want to talk about it so its something to add to my end of life plan at the Hospice. So the meeting came to an end and we had really enjoyed the day. Liz and I went outside together and Ray had been walking Louis so he was ready to go home. As Liz was looking at the motorhome the heavens opened she ran to her car and I tried to dive in the M?H slipped on the steps and fell in a bush. So funny and I got drenched. The rain is so heavy when it start. We soon travelled out of it and came back to sunny Kent. I would like to thank Mesothelioma UK for allowing me to attend I do find it so Interesting and love the meet ups with such lovely people and thank you to the sponsors AstraZeneca UK Ltd,Medela UK LTD, Pfiser Ltd and Rocket medical but most of all Irwin Mitchell Solicitors who are such a lovely bunch of people. Well done to everyone. I thought it would be good to bring together all I knew about the man behind Keytruda. Merck has really worked hard at this and to think when a man sat in his Laboratory and first made this drug, with the help of mice, he put it to one side and didn’t know what to do with it until another scientist found it on the shelves of a fridge and realised just what it could do. Amazing !!! Vice President of Antibody Discovery and Protein Sciences, Scholar Rock, Inc.
Age Total Calculated Compensation This person is connected to 0 Board Members in 0 different organizations across 1 different industries. Dr. Gregory J. Carven, also known as Greg, PhD, has been Vice President of Antibody Discovery and Protein Sciences of Scholar Rock, Inc. Dr. Carven has more than 15 years of antibody discovery and development experience, including his role as co-inventor of Keytruda(R) (pembrolizumab), the first PD-1 inhibitor for cancer immunotherapy to receive FDA approval. In his leadership role at Scholar Rock, Dr. Carven direct the Scholar Rock’s discovery and design of therapeutic antibodies as first-in-class niche modulators for fibrotic, musculoskeletal and autoimmune diseases. Dr. Carven is an acknowledged leader in the discovery and development of antibody therapeutics. A particular highlight of his more than 15 years of antibody discovery experience was his leadership of the discovery and preclinical development of Keytruda(R) (pembrolizumab; MK-3475; anti-PD-1) from its invention through to IND filing. He was Head of hybridoma research within Pfizer’s Global Biotherapeutics Technologies division and was responsible for discovery and engineering of antibodies and antibody binding domains for a wide variety of therapeutic areas. Prior to joining Pfizer, Dr. Carven held positions of increasing responsibility at Merck Research Laboratories (formerly Schering Plough Research Institute and Organon Biosciences), and was a scientist at Phylogix, Inc. Dr. Carven received his PhD in Biological Chemistry from the Massachusetts Institute of Technology, and continued his research on the characterization of conformational changes in class II MHC molecules using conformation-specific monoclonal antibodies at the University of Massachusetts Medical School. Pembrolizumab was invented by Gregory Carven, Hans van Eenennaam and John Dulos at Organon Biosciences. MRC Technology humanized the antibody pembrolizumab for Organon in 2006. On September 4, 2014 the US Food and Drug Administration (FDA) approved pembrolizumab under the FDA Fast Track Development Program. It is approved for use following treatment with ipilimumab, or after treatment with Ipilimumab and a BRAF inhibitor in advanced melanoma patients who carry a BRAF mutation. It is marketed by Merck. On October 2, 2015, the FDA approved pembrolizumab for the treatment of metastaticnon-small cell lung cancer (NSCLC) in patients whose tumors express PD-L1 and who have failed treatment with otherchemotherapeutic agents. Pembrolizumab was priced at $150,000 per year when it launched. Pembrolizumab is a therapeutic antibody that blocks the inhibitory ligand of programmed cell death 1 receptor located on lymphocytes. This receptor is responsible for inhibiting the immune response to cancer cells which express programmed death-ligand (PD-L1 or PD-L2). Normally, this effect is necessary to avoid inappropriate overreaction, such as an auto-immune disease, in healthy individuals. In cancer patients antibody blockade against this receptor such as with Pembrolizumab reinvigorates the immune system, allowing it to target and destroy cancer cells. Pembrolizumab is one of a number of closely related therapies dubbed checkpoint therapy. Also in 2015 the drug was in Phase II clinical trials for non-small-cell lung cancer (NSCLC) in patients with oligometastatic disease. The KEYNOTE-012 phase IB study is testing pembrolizumab for triple-negative breast cancer (TNBC), gastric cancer, urothelial cancer, and head and neck cancer. It reported encouraging interim results (eg in TNBC) in 2016. The ongoing phase II KEYNOTE-086 study is evaluating a 200-mg dose of pembrolizumab, given once every 3 weeks, in patients with TNBC. Then this story emerged around the world and we became interested in Keytruda But by this stage I was on the trial MK3475-28 after hearing so much about the drug for sometime through Immunotherapy was becoming the in word. The treatment that was going to give Mesothelioma the cure. Little did I know that I would be playing such a huge role in the story. Australian Grand Prix supremo Ron Walker has been declared cancer-free after a nearly three-year fight for his life. As he prepares for his final Albert Park Formula One race as chairman of the Australian Grand Prix Corporation, Walker revealed his remission was confirmed late last year following treatment with an experimental drug in the US. He was satisfied he had beaten the cancer that 2½ years ago riddled his body, because scans and blood tests had cleared him of the malignant disease. “The doctors in America announced me to be cancer-free 12 weeks ago, so I’m the luckiest guy that ever walked,” Walker told Fairfax Media. His recovery has defied a grim diagnosis by the Peter MacCallum Cancer Centre in November 2012 that he would not make Christmas that year because radiation treatment and a conventional immunotherapy drug had failed to arrest the cancer. Walker, 75, was found to have a melanoma on his forehead in February 2012, but late that year the skin cancer had spread throughout his body. Along with an adverse reaction to a local drug treatment, the life-threatening extent of the cancer drove him to secure a place in a trial for a new immunotherapy drug called Keytruda in Los Angeles. While he was wealthy enough to afford the regular trips to LA in 2013-14 and the cutting-edge drug treatment, which he admitted “wasn’t cheap”, he campaigned to have Keytruda approved in Australia at an affordable cost to cancer patients. The former lord mayor of Melbourne and long-time federal Liberal Party grandee has successfully lobbied Canberra for the drug – which was fast-tracked onto the American market last September – to be available in Australia on the Pharmaceutical Benefits Scheme. He said prevailing on his Liberal Party contacts in the federal government, including Prime Minister Tony Abbott, to make Keytruda available and affordable to everyone was his way of helping other less fortunate cancer victims. 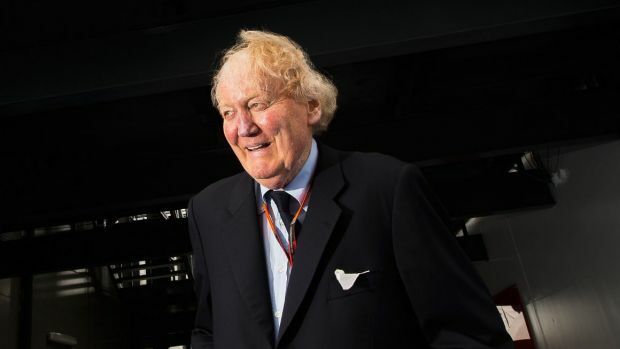 Walker, who will step down as chairman of the AGPC after 20 years following Sunday’s F1 season-opener at Albert Park, dismissed his fortune – estimated to be in the hundreds of millions of dollars – as the live-or-die difference. “Leave the money aside,” he said. “I could’ve got a cheap air ticket. If I didn’t have a dollar, I still would’ve gone on a cheap flight somehow. However, Walker conceded his connections in high places, made during nearly three decades negotiating major event deals for Victorian governments of both political persuasions, opened doors for him to get into the US trials of Keytruda. “I was just lucky enough over the years to accumulate a lot of contacts,” he said. With the backing of then premier Jeff Kennett, Walker was instrumental in “stealing” the Australian Grand Prix from Adelaide in 1993, with Melbourne taking over the race at the revived Albert Park lakeside circuit – used for international motor races in the 1950s – in 1996. Although his battle with cancer has taken its toll on his 198-centimetre frame and left his once luxuriant head of red hair grey and wispy, he never lost his commitment to the grand prix. “Working for Ron in that period of time, nothing’s changed as far as his continued passion for the event, and the ideas and the frequency of those ideas,” AGPC chief executive Andrew Westacott told Fairfax Media. Walker expressed confidence that his successor as chairman of the AGPC would guide the organising team to maintain the high standard of the race, which was last year renewed from 2016 to 2020. JUST UPDATED – TheStreet’s Biotech Bible! Before you invest one single dime in any biotech stock you have got to KNOW WHAT YOU ARE BUYING! Get THE most comprehensive text covering the 186 biotech companies that have gone public since 2013! There’s nothing else like it for digging into this highly speculative group of stocks. Grab a FREE copy today! You see Jim Cramer on TV. Now, see where he invests his money. Check out his multi-million dollar portfolio and discover which stocks he is trading. Learn more now. Dear Mavis, My name is Nika, I am 35 and I have 4th stage Mesothelioma almost 6 years. I am struggling. However I can’t get carbo-pemetrexed because it is my third chemotherapy during these years, I have too high toxicity already and my body can’t resist to this treatment anymore. I am looking the trials with opdivo or keytruda. I have EU citizenship and I came to UK to find the way to survive. Please help me to contact necessary people. Without national insurance no one can’t help me. Do you know any contacts who I can speak with, who can help me? Thank you so much for your help and assistance. She told me she had lived in Lithuania, than in Israel. and like myself , when on Chemo she had exceeded toxicity in her body and there was no more chemo for her, With pemetrexed it is slowly growing So I told her that the best thing would be to get in contact with MSD Israel as I had read they are investing Imunotherapy in Israel . At the end of January I Nika was so happy –Dear Mavis, I have got great news! The trial with keytruda is worldwide. I could participate in Israel too. I am really happy about that. Mavis, do you know something about keytruda action vs fertility? Do I need to preserve my ovaries with decapeptyl 3.75 as I did it when I had chemotherapy? Have you heard about keytruda action and reaction to the young women? This wasn’t a problem I needed to worry about so I advised her to contact MSD again and ask about fertility. In February Nikas told me I am waiting for the answer from merck, thus week my pathology will be sent to US. During one month they should give me an answer if I am starting trial. She then told me she had been interviewed the main Israel’s channel. They are making report about Keytruda. The target is to explain to the ministry of health how important would be to enter this encouraging drug to health basket. That people would have possibility to get it for free or for less money. In the interview I told how I found you and you helped me to make a right choice. Maybe you would agree to act in a scene how we are talking via Skype about keytruda? They would like that people would hear that from you, that it helped you, that you are alive and helping people all over the world. Reporters are very nice people. They are trying to make movie about keytruda as soon. Would you agree to participate in this interview, Dear Mavis? Reporters will talk with you later and explain if you will accept this. That’s because of you. You gave me a hope and underlining what I need to do.Any answer is ok. So of coarse I answered I would be delighted and we waited months for it to hapen. Nika then contact again to say she had done her part The main thing they want to explain and to show how critical to some people to get this treatment if they do not have money to pay for it even. We did our Skype together and Nika questioned me and I answered. It was chaotic really with the camera man walking in front of the camera but of coarse I knew they would edit. Now it has been shown on TV in Israel I realise they have edited so much and I have only a short peace but I really do not mind. Just playing a small part in such a wonderful film of three courageous young people –If only I could understand what was being said. ha ha !! I get the jist of it and the word Keytruda is being said over and over again. There is even a small clip showing Keytruda being Manufacturing and the bottling of the drug from the vats -just as MSD had told me, this is done in Ireland. Nika has had her 5th injection no so I pray she is doing well. It has shown how We are struggling to have more of the drug in trials and how so many Meswarriorsa around the world are struggling to pay privately for the drug as they are in UK, US and Australia. The traffic was good and we got there far to early so we had a coffee and sat and waited for 8pm. The night staff were soon on and gave me a great welcome surprised to see me again. Sitting in the waiting room and all the staff as they came in were really happy to see me again and i had to explain why all the time. Called in by Rex he was so amused and told me to take it as a bonus as he too worked it out I had done 52. So he put a canula in and drained my blood from me filling up my 7 phials . Blood pressure and temperature and weight next. Back to waiting room where Nicky the receptionist for rehab walked in and just was ecstatic to see me and Ray again. Oh I have missed them all lots of hugs and kisses and a coffee shoved in my hand. The Doctor called me in and said Merck want me to have the two infusions so that was it. I asked about my scan and he looked on the computer and said its all fine remission it is. Oh how wonderful to hear him admit that. Everyone has been too scared to call it that as it just isn’t a word they have been able to say with Mesothelioma. So he approved my drug and we went back into the waiting area and chatted to Nicky as she has been putting The Mesothelioma UK book out for me and also Mesowarriors that have been going for their treatment have been collecting them. I took a few down to the large waiting room in the clinic area and placed them on a table there as that’s where people get the devastating news of their cancer. We sat around and a man and his daughter, that had come up in the lift with us. came into the room. I just knew he was a warrior in the lift, but didn’t like to ask, he told me he knew me. His daughter has been emailing me and I got him to go to the Marsden through her. It’s lovely to meet the faces behind the emails. Not everyone is on Face Book so my blog is great to link people up to me. He has had to give the trial a rest as his white blood cells are too high. They want that to settle down again. I loved the positive attitude and he even works through the illness, that amazes me as I don’t know where he gets the strength to do that. His daughter had phoned her sister to say that I was there and she was so upset she wasn’t there to meet me, so we had to do a photo for her. it really tickles me this friendship of the Mesowarriors. These two sisters are going to mix in well with out Mesowarriors that go away for fun and laughter as we do. Mind you Ray wasn’t a laugh he was asleep all the time we had been talking. He has a special chair there and once he is in it he sleeps. At last I could go home and back to a Friday on the M25 and the struggle through the traffic. Merck (NYSE:MRK) looks like it will win the race to have the first immunotherapy drug to gain Food and Drug Administration approval to treat newly diagnosed non-small cell lung cancer patients; but don’t count rival Bristol-Myers Squibb (NYSE:BMY) out just yet. In a clinical trial called KEYNOTE-024, Merck said that patients receiving Keytruda fared better than patients who received chemotherapy, the current standard of care. The drug extended both progression-free survival (PFS), which measures when a tumor starts growing again, and overall survival. Merck didn’t put any numbers to those claims. It’s waiting for a medical meeting to disclose the extent that Keytruda was able to extend PFS and overall survival. The European Society for Medical Oncology meeting in October would be one logical place to present the data, although I’m sure investors would prefer to see the data before then. Keytruda and Bristol-Myers Squibb’s Opdivo both bind to a protein called PD-1, blocking the interaction between PD-L1 on tumor cells and PD-1 on immune system cells called T lymphocytes, which normally tells the immune system not to attack the tumor cells. In the presence of the drugs, the negative signal is blocked, and the immune system is activated and attacks the tumor. Both drugs are approved for later-stage lung-cancer patients, but Merck screened its patients for PD-L1 expression, and therefore is only approved for strong expressers of PD-L1. Bristol-Myers Squibb skipped that step, and still saw an effect, so Opdivo is approved for a larger number of patients, and doctors don’t have to screen for PD-L1 before using the drug. In KEYNOTE-024, Merck took the same approach as before, looking at the expression of PD-L1 lung-cancer cells, and only enrolled patients with tumors expressing high levels of PD-L1, defined as a tumor proportion score of 50% or more. Bristol-Myers Squibb is also running a trial in newly diagnosed patients, called CheckMate 026, with data due this year, but its trial allows for all patients to be enrolled if the initial cohort of patients with high PD-L1 sees a benefit from Opdivo. It may not matter which drug extends overall survival as a monotherapy, or whether Bristol-Myers can capture more patients by not requiring screening, because both companies are running clinical trials testing the drugs in combination with other drugs in newly diagnosed patients. Merck is testing Keytruda in combination with two different types of chemotherapy in newly diagnosed lung-cancer patients in clinical trials called Keynote-189 and Keynote-407. Likewise, in a clinical trial dubbed Checkmate-227, Bristol-Myers Squibb is testing Opdivo in combination with chemotherapy in newly diagnosed lung-cancer patients. As part of that trial, other patients will get Opdivo in combination with Yervoy, another immunotherapy sold by the company. If all that competition wasn’t enough, Roche is testing its immunotherapy Tecentriq in lung cancer. The PD-L1-blocking drug has already shown good results in bladder cancer, having been approved for that tumor type in May. Congratulations to Merck for scoring the first punch in round two of this lung-cancer fight,. Investors, however, should keep in mind that this round isn’t over, and the battle is a 10-round bout where neither drug is likely to win by KO. Brian Orelli and The Motley Fool have no position in any of the stocks mentioned. Try any of our Foolish newsletter services free for 30 days. We Fools may not all hold the same opinions, but we all believe thatconsidering a diverse range of insights makes us better investors. The Motley Fool has a disclosure policy. Exciting time as tonight I’m on Israel TV. It was a Skype Interview I did with a dear friend who I had helped to get onto Keytruda and she was asked to talk about it on TV. I will have a link when they put it on-line but until then I have had to ask friends if they have contacts in Israel to tell me how it all goes..
Last year we hear at least once a week on “the new medicine that conquers cancer”. The last few months I went out, along with Noa Saturn, following the story of one of those drugs, showing as “ACE” in front of the number 1 Killer in the world. Hqytrwdh managed to cure terminal (meanwhile mostly certain forms of skin cancer, kidney and lungs), And she has a pretty impressive database of stopping the disease and even tumors whʻlmţm reduction. Any other types of cancer, the effect of the medicine is still under investigation, it is unclear who is going to help patients and who doesn’t, but one of course not giving up hope. So where’s the problem? For the price. Between 20 to 60 $ a month. Our film “life too precious” will be broadcast tomorrow at 22:10 ON CHANNEL 2, following 3 patients who fight about hqytrwdh: Life, Nica and adi. Disposable Heroes who find themselves in a nightmare twice: on the one hand fight terrible diseases and on the other hand the race to raise the money for the drug might save them. People break savings, exciting facebook posts from friends, raising benefit shows and sometimes even a home equity loan with this, for a chance at life, chance to heal. Towards the end of the movie, sitting in front of us tal morganstern, an economist at the health department who runs first negotiating prices of medication, which tells of cynicism is shocking where she ran into. How pharmaceutical companies sitting people wmţmẖrym medication regardless of the cost of production and development, only by the price of our fear. This reality where cancer patients find themselves all alone – no registers patients, without an insurance company, in most cases, even without the help of the state, the reality that rich will live and everyone else dies, must change. I hope our film will help even a little bit. The translation by Google is funny but at least we have the gist of it. I though this was a photo of my last infusion —-WRONG !! Yesterday as I was sitting in the Den here when at 8.40 the phone went. It was a foreign voice asking if I was Mavis Nye , I replied yes thinking to myself Oh yes a cold a call getting ready to put the phone down. Good job I didn’t it was my Doctor at The Royal Marsden to tell me they have been contacted by Merck and that I was 2 doses of my drug short. This happened when I was very ill with a blood infection which was down to a Bug in the PICC line. Merck want me to have these even though my result is great. So I have had to arrange this Friday to go back and have 1 dose and the other in 2 weeks. well I wasn’t expecting that. So I will be going back to see my lovely medical team at the Marsden but at least I will have my scan result tomorrow. We have many Mesowarriors finding hope with 2 new trails that are coming through for UK and around the world have the chance at them. Good luck to you all I send hugs to all the Mesothelioma Warriors I share the common bound with. my email is mavisnye@yahoo.co.uk. I have been bonded to Lou Williams in Australia as I helped when she went on Keytruda and was able to help her doctor with the dosage information. To all warriors around the world I send my love, warrior strength and cocooned hugs to you. 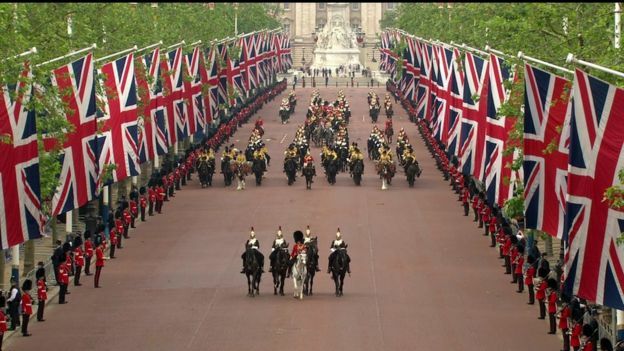 A Diary Of A Mesowarrior Living With #Mesothelioma -A Royal Weekend, And Sue Stephen’s Asbestos In Schools Petition. 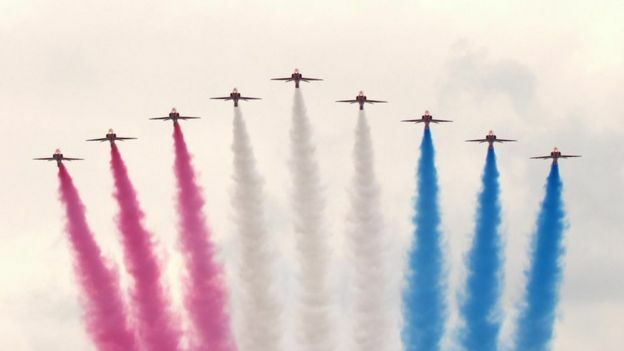 Everyone talking about the Queens outfit being such a bright colour but it has been explained that security has dictated she wears these colour’s so that she can be seen if they have to act on any terrorist attack . I must admit that like so many I love all this. The Queen has been part of my life as she has always been there. 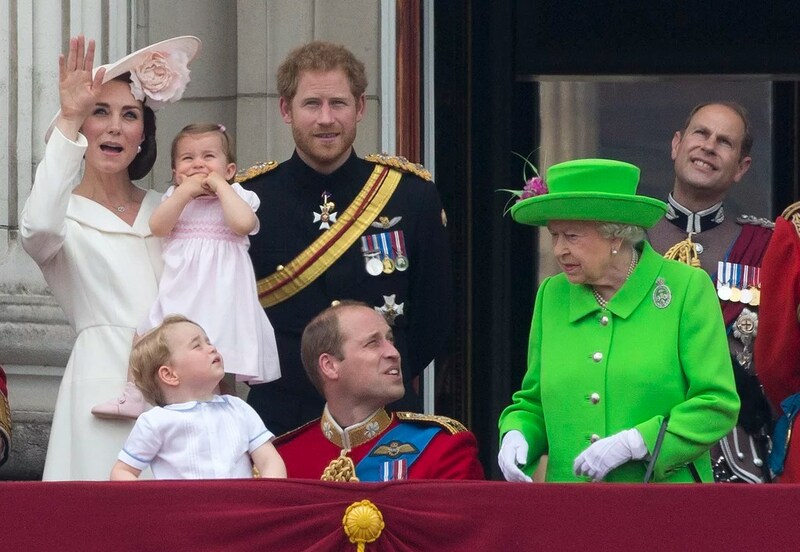 I was a war baby so I to have seen so much and there is always a Royal Occasion taking place. Now her Palace is in trouble with Asbestos as the old building is crumbling and revealing the dangers that they only use it as -The Office. Prince Charles will not use it when he is King as he has such a comfortable home at Clarence House and HighGrove. So that was the weekend I wont talk about Football as the Russians have caused our fans so much trouble but I do have to mention the sad shooting in Orlando. The killing 50 people and wounding at least 53, police has been a shock to the world. You just never know what will happen when you wake up each day but we musnt let people like this win. We must live our lives and not be afraid. Our love and thoughts go out to the families and friends of both the dead and the casualties who have to heal again. I dont think their minds will ever heal though. It would be good if it bought about the end to guns the US needs a ban on guns but that doesn’t really stop terrorists as we know so well in this country. Could I ask everyone of you that reads my Blogs to sign this. We have a huge problem in our Schools with Asbestos. It has been covered up for years but our publicity is working and we are fighting hard for Asbestos In Schools. This should not happen and we just dont know how many children wont reach old age because of Mesothelioma in years to come. We want every school in the UK to have to produce an annual report about the type and condition of any asbestos on the premises and share this with all parents and staff. Every child’s potential exposure to asbestos at school must be recorded and shared with parents. The Government must introduce and implement a policy for the phased removal of all asbestos from schools to be completed by 2028, starting with the most dangerous asbestos. My Mum, Sue Stephens, was a primary school teacher in Buckinghamshire for almost 30 years. She taught over 800 children and was a wonderful teacher and very committed to her work. Some of her ex-pupils recently wrote to her saying ‘you were the best reception teacher we could ever have wished for and you gave us the best grounding in education that anyone could ever have’. Tragically my Mum is now dying from mesothelioma, a cancer that comes from exposure to asbestos. It can lie dormant for a long time, meaning that victims are diagnosed with the illness 15 to 60 years after their exposure. Mum believes she was exposed to asbestos in the school she taught in. Although Mum is now in the last weeks of her life, she is horrified that teachers and pupils continue to be exposed to asbestos in schools. I’ve promised her that I will do my best to make sure no-one else has to suffer like she has. • Children are particularly vulnerable to developing mesothelioma. A five year old child that is exposed is five times more likely to contract mesothelioma than someone exposed to asbestos in their 30s. It is reported that between 200 and 300 people die each year as a result of exposure to asbestos when they were children at school. All of these deaths are completely preventable. We’ve known the dangers since the 1960s with legislation controlling its use since the mid-1980’s. 2 million asbestos fibres can fit on a pin head but mesothelioma can develop from ingesting only one or two fibres. Despite this people continue to be put at risk due to the failure of successive governments to remove asbestos from our schools. I’ve seen first hand the pain and suffering that mesothelioma causes. I’m already losing my Mum to this terrible disease, I need to be sure that my school age daughter is not in danger simply by going to school. We can’t let more of our children and teachers die from this entirely preventable disease. Nicky Morgan must prioritise the removal of all asbestos from all our schools.